On a hot June morning in 1975, a shoot-out between FBI agents and American Indians erupted on a reservation near Wounded Knee in South Dakota. Two FBI agents and one Indian died. Eventually four Indians, all members of the American Indian Movement (AIM) were indicted on murder charges, Twenty-two years late, one of them, Leonard Peltier, is still serving two consecutive life sentences. The story of what really happened and why Matthiessen is convinced of Peltier's innocence, forms the central narrative in this classic work of investigative reporting. 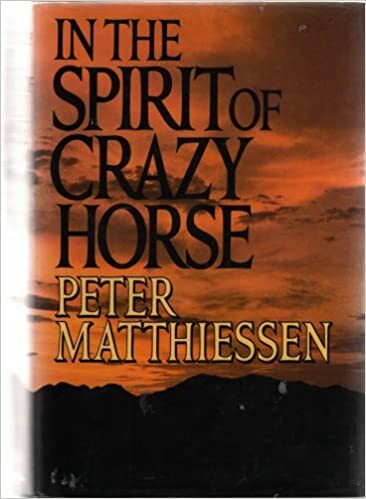 But Mathiessen also reveals the larger issues behind the Pine Ridge shoot-out: systematic discrimination by the white authorities; corporate determination to exploit the uranium deposits in the Black Hills; the breaking of treaties; and FBI hostility towards the AIM, which was set up to bring just such issues to light. When this book was first published it was immediately the subject of two $25 million-dollar legal actions that attempted to suppress it permanently. After eight years of court battles, ending with a Supreme Court judgement, Mathiessen won the right to tell Peltier's and his people's story. Cleveland’s Indian Center in 1970, he went to Minneapolis for an Indian conference; upon his return, he established Cleveland AIM. In the fall of 1970 and again in the spring of 1971, AIM (and a traditional group called “the Oglala Sioux Tribe”) established a symbolic camp at Mount Rushmore, in symbolic enactment of Lakota claims to the Black Hills. Means participated in the demonstrations at Mount Rushmore and also in the National Day of Mourning at Plymouth, Massachusetts, on Thanksgiving Day. occupation.) To the white men, the “hostiles” seemed to have no spokesman with the authority to make decisions (or not, at least, in the orderly western way), and the early meetings, as they saw them, were mostly exercises in fiery rhetoric from Means and Banks that attracted unwelcome publicity to the whole business, and perhaps stirred up trouble among other Indians as well; on March 5, the Northern Cheyenne, followed soon after by the Crow, canceled all the mining leases on their reservations.